There is a fast, practical solution. Manufacturers are increasingly partnering with reliable service providers to find the skilled workers they need. Operating an efficient, profitable plant requires dedication to best practices and relying on cutting-edge technology to develop ways to rise above competitors. The move toward industrial digitization and the continual collection and assessment of a deluge of operational data drives an increased need for advanced skill sets. The speed of technological advances also makes manufacturing processes, equipment and machinery increasingly more complex. Skilled workers need specialized training and knowledge to be productive in today’s facilities. They also need to regularly supplement their knowledge and skills sets and stay current with industry developments. Retaining workers with high-level skills and in-depth experience is turning into a race against time. Experienced workers are retiring in droves, leaving the skilled labor workforce and taking their specialized knowledge and skills with them. Adecco determined that as Baby Boomers are retiring, 62% of firms already struggle to fill the skilled trade positions they leave behind. Seventy-four percent of firms believe they will grapple with the problem in the future. The cost of not addressing this challenge is steep. 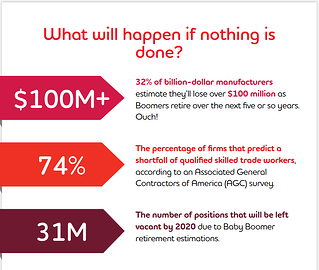 Manufacturers estimate they could lose over a $100 Million as Baby Boomers retire over the next five years or so, leaving 31 million positions vacant by 2020. As Baby Boomers are clocking off the floor for their final time, Millennials aren’t rushing in to fill the void. As a career choice, the industrial manufacturing industry suffers from an image problem. Manufacturing is not typically seen as a progressive, innovative field. Some manufacturers also have trouble competing with the flexible benefits and higher pay packages workers are offered at other companies. The lack of interest in establishing careers in manufacturing trades is apparent in the results of Manpower’s 2016 Talent Shortage Survey, which shows 46% of U.S. employers had difficulties filling jobs due to lack of available talent. For the eighth year in a row, skilled trade jobs were the hardest to fill in the United States. Other job roles related to industrial manufacturing that also made Manpower’s top 10 hardest-to-fill list include drivers, laborers, engineers and technicians. Nearly a quarter of employers say they aren’t attracting enough applicants to fill open job positions. People who do apply often lack the required skills and experience, or they expect to be paid much more than employers are prepared to pay. More plant managers are building relationships with outside vendors and service providers for a cost-effective and dependable way to quickly close the skills gap in their workforce. Manufacturers’ reliance on outsourcing solutions has grown in recent years. 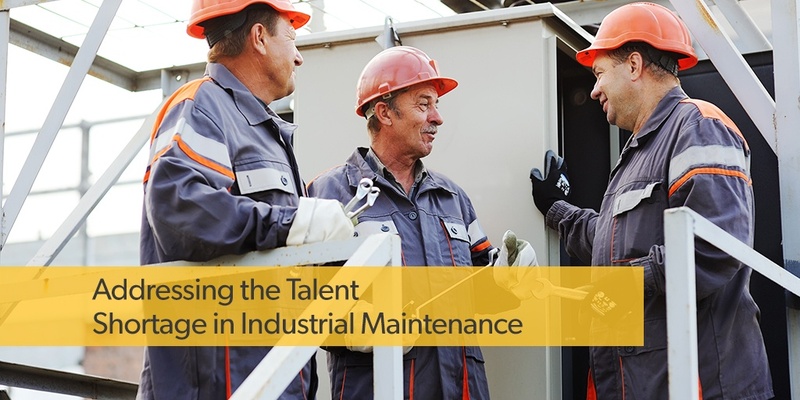 Plant Engineering’s 2016 Maintenance Report says nearly a quarter (22%) of manufacturing firms depended on outsourcing to meet their maintenance needs last year, a 15% increase over the previous year. Results like these demonstrate an increasing confidence in the benefits of relying on a service provider to combat their workforce challenges. Plus, resources that would have been spent on training and rebranding efforts can be allocated to other areas. The skilled labor and staffing challenges facing plant managers continually evolve. By shifting the significant costs and burdens of keeping up with their changing needs to LubriSource, manufacturers discover a permanent bridge across the current skills gap and into a more productive future.